Will native advertising bring about the death of the credible journalist? It’s official. Native advertising is here to stay, and it’s probably the worst thing to happen to journalism since the Internet. Corporate influence in the media has been around since the invention of the advertisement and consumers have been fully aware of it. The term used by news has always been the “separation of church and state.” The recent explosion in popularity of native advertising, however, is rubbing many consumers the wrong way and has moved into a moral grey area that blurs corporate self-interest and honest, respectable journalism. If you are unfamiliar with what native advertising in journalism is, just go to BuzzFeed.com and pick any article at random. Chances are the article is “sponsored” by a certain company but in a very subtle way. And I use the word ‘article’ very loosely. It’s literally 21 gifs with one-sentence headlines! Hopefully you respect your brain cells enough to not read BuzzFeed, but it is a great example of native advertising today and where it’s heading. Native ads are a byproduct of consumers’ inability or unwillingness to pay for content online. When newspapers made the shift to online, they hoped people would continue paying to read the New York Times online, for instance. ads have become the hottest new revenue stream for news companies because it keeps content free to the user. In return, all the new sites have to give up, well, most of their journalistic credibility. But news sites want you to know that this isn’t a bad thing. There’s even a Huffington Post article out there which sets out to dispel “8 Myths about Native Advertising.” In what couldn’t possibly be a bigger conflict of interest piece of journalism, Huffington Post informs the reader that native advertising is, in fact, a great thing and that we should embrace it because of course if we don’t, Huffington Post will go bankrupt and become irrelevant. The article posits that “a good native ad must entertain and inform the reader.” But here’s where HuffPost is blissfully ignorant. They don’t see that it takes literally all journalistic credibility out of an article when the sole purpose of writing it is to receive a check from the sponsor. Huffington Post even has the audacity to say that “good native ads can actually outperform editorial.” They reference their piece, “9 Disgusting Things You Didn’t Know You’ve Been Eating Your Whole Life” and how it has become more popular than some of their editorial stories. Just a true masterpiece article start to finish, complete with big colorful pictures and short bullet points. You know, the way journalism was meant to be. Good on you, Buzzington Feed — er, I mean Huffington Post. And just when you thought the newspaper staples were safe, native ads have already hit the New York Times. A recent editorial on the state of women in prisons was a great read and really came off as informative and an inspired piece of journalism. Except the fact that it was sponsored by Season 2 of “Orange is the New Black.” Yes, it was a well written article, but it was still essentially just an advertisement. But what else would she say? Native ads are the only option right now. Just think of how ineffective traditional banner ads are online today. Click through rates are less than 0.1 percent and on mobile devices research shows that up to 50 percent of banner ads are clicked on accident. 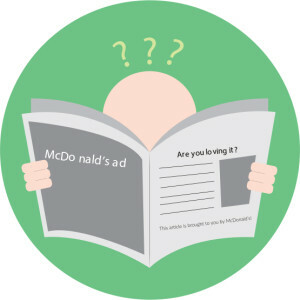 So native advertising for some is the future, but is there not a better way to do it? Instead of essentially tricking readers into thinking they are reading a legitimate news article, there should at the very least be a large disclaimer either as the teaser or at the outset of the article. This way, consumers can decide when and where they want to be marketed to instead of being the victim of this new form of stealth marketing. Unfortunately, the reality is that these types of advertising are mainstream and popping up on sites such as the Atlantic, TIME, the New York Times and Huffington Post at alarming rates. They’re not going anywhere soon, so if they rub you the wrong way as a consumer, let the companies know. I like to make a mental note of who sponsors certain articles and I try and avoid that product at the store. If you’re really passionate, you can even write in to the company asking them why they feel they need to advertise their product in that way. But in the meantime, for any journalism majors out there, might I suggest minoring in marketing?